So begins “The Place of the Lion,” by Charles Williams. If you’ve never heard of the book or its author, don’t be surprised. Charles Williams was a lesser known member of the famous writers group The Inklings. C. S. Lewis and J.R.R. Tolkien were two of its more famous members. I had never heard of this author either until a few months back when I happened across this book at one of my favorite thrift stores. For only ten cents I couldn’t pass it up. This weekend I picked it up and began to read. I’m glad I did. The story examines what would happen if “between a world of living principles, existing in its own state of being, and this present world, a breach had been made.” Thus the escaped lioness becomes the archetypal LION. Other archetypes begin to appear as well. Fun ensues. OK, maybe not “fun” exactly, but it sures makes for a fascinating tale. I’m only five chapters in, but at a bit over 200 pages this won’t take long to finish. So far I can see more than a little of C.S. Lewis in here, which isn’t surprising since evidently Lewis and Williams were close. I’ll give a complete report when I’ve finished it. So The American Heritage Dictionary defines Book as “A set of written or printed pages fastened along one side and encased between protective covers.” Books are physical things. You can touch them, smell them and see them. They are often works of art. E-Books are digitized information. They are not books. You can only read them through your computer, E-Reader or some other device. Those things aren’t books either. Sure, one can store hundreds of E-Books on a device, but it looks lousy on a book case. That C. S. Lewis quote from yesterday wasn’t meant to be a stand alone item. I mean, Lewis is always good for a quote, but yesterday’s wasn’t particularly brilliant. Actually, it stated something that would seem to be fairly obvious if one were to think about it. But not many people do. Imagine that. The solution involves books. Old ones at that. As one might guess, I happen to agree with him. Today’s world, perhaps more than in the past, is held in thrall to the new and shiny. Technology thrusts obsolescence on us every day. We want the latest news, the latest opinions, the latest books. Last week? Really? Now Lewis probably had in mind the writings of Plato, Aquinas or even Milton. I don’t believe one needs to go back quite that far (although it certainly couldn’t hurt!) Personally, some of the ideas that have stayed with me the longest came from people who were writing 50 to 100 years ago. There were some damn good writers and thinkers back then. The point is that we need to read the good stuff from years past, then take that knowledge and see how it plays in today’s world. Some of it will be dated, sure. But a lot of it could help us see today’s world more clearly. That’s a big part of what I’ll try to do with this blog. I want you to know about some of the good old stuff that influenced me. And I’d love to hear about some of the good old stuff that influenced you, too. This age could use a good breeze. This is why I love going to thrift stores. 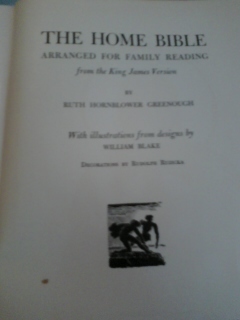 “The Home Bible” from 1950 is a personal edit of the King James Version done by Ruth Hornblower Greenough. The subtitle is “Arranged For Family Reading.” It also includes several illustrations from designs by William Blake. With no book names or chapter and verse numbers, the biblical stories and poems flow along. I found this wonderful book at the Disabled American Veterans Thrift Store in Prescott, Arizona yesterday. I also got the satisfaction of helping a fine group of men and women. My name is Rob and I’m an old book junkie. I mean, I’m old and I love books. I also love old books. So you can take the title either way. It all comes out the same. Put me in a room full of books and I’m a happy camper. Literally. I’ll camp out in that room until my wife comes to pull me out of there. I’ve been that way most of my life. I have my dad to thank for that. A love of books was his greatest gift to me. As a kid back in the late 50s and early 60s, Mom, Dad and I would drive down to Newport Beach or Laguna Beach and hit some of the thrift stores there. Of course, back then they were called “junk shops.” They were wonderful. Great old knick-knacks and curios and yes, books. Dad would always head to the book section, and I’d tag along with him. I knew there was a good chance I’d score a cool book of some kind or another. Most of the time I was right. I was hooked early and I still can’t kick the habit. Nor do I want to. Do you love books? Are book shops your favorite places? Do you frequent thrift stores or garage sales hoping to find some dusty, bound treasure? How did your love affair with books and words and ideas begin? Come along, my friends. Let’s go exploring. My name is Rob and I’m not much of a tech person. I’m still trying to figure out how to drive this new vehicle called a blog. Be patient and I promise I’ll have some interesting content for you soon. Have a great day, all!